This page details small shrubs available from Aspley Nursery - it highlights some of the less known plants useful in landscape as well as more popular plants. This is a very hardy small clustering plant to only 250 mm. 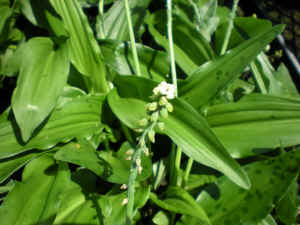 It has heads of small white flowers in early spring. This plant will grow happily in quite dark areas but will also grow well in bright semi shade. 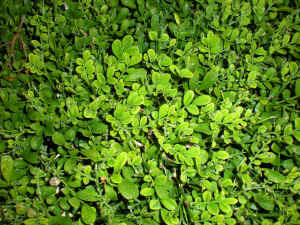 The fleshy leaves featuring small dark green spots matt over the ground creating a barrier to weeds. This is a useful plant on the southern side of taller buildings in deep shade. Bougainvillea's temple fire is the oldest grown dwarf Bougainvillea. 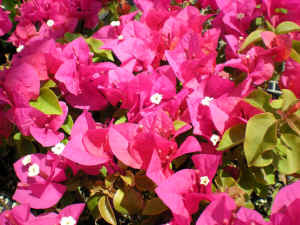 It has been used for hybridisation to produce many of the smaller growing Bougainvillea available. In general it will grow to about 500mm in an open growing full sun position, it will grow taller where it is in semi shade especially if it is in amongst other shrubs and trees where it can "lean" on those plants to search for the sun. When grown in full sun it will flower heavily especially in areas of harsh conditions where it puts it's energy into flowering rather than new growth. It has quite small thorns hidden amongst the magenta coloured bracts. Gardenia Florida is one of the most versatile of the Gardenia Florida as it will grow in sun and shade, and can be kept as a formal clipped hedge or as an informal hedge. The stunning double flowers and beautiful fragrance is another benefit. This is one of the most reliable landscape plants available with it's hardiness and disease resistance. 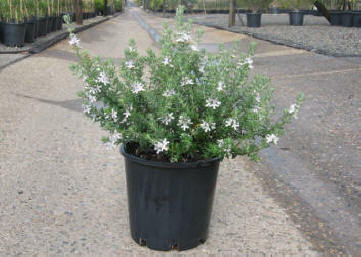 Leucophyllum is commonly called Texas Sage and this is a selection of that plant. Over time it will grow to 1.5m but can be pruned for use as a small hedge. It's a very tough drought hardy plant that has a silver green foliage and has small Lavender bells throughout the warmer months. Murraya Mina Min is a selection made by Trevor Garrad. 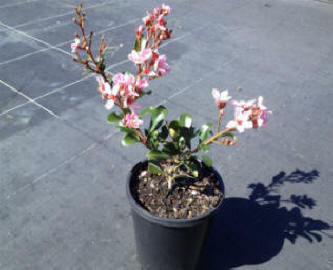 It is an excellent hedging plant that has small densely packed leaves and pure white flowers. 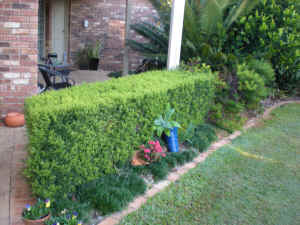 This is an excellent replacement for Buxus in sub tropical gardens and is easily maintained requiring an occasional clip to keep it shapely. I have a box hedge of Murraya Min-a-min PBR that I maintain at about 600mm and another I keep at 400mm both are easy care, pest free and require pruning about every two months- slightly more in summer less in winter. The pruning basically means I don't get much flower but it is more than made up for with it's neat appearance. 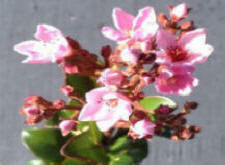 Rhaphiolepis Yedda is a hardy form of Indian hawthorn. 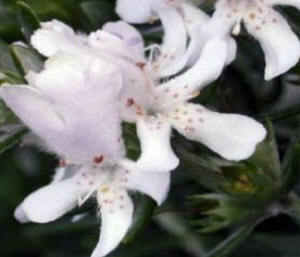 It has the same cluster of bright white flowers as other Indian hawthorn but is a dwarf form. It grows about .7m with an upright habit and tough dark green foliage. This plant will grow in full sun or full shade, it's very tough making it an excellent landscape selection. Rhaphiolepis Cherry Blossom is a small dense growing shrub producing masses of small pink flowers from late Winter through Spring. A very hardy plant which can be grown in full sun. Westringia zena are tough and fairly drought tolerant. 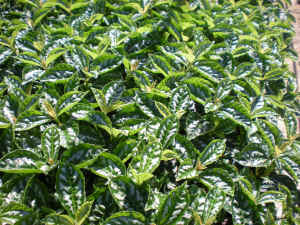 Zena is a fast growing shrub with blue green foliage giving a silvery appearance. Zena is ideal as a small hedge producing clusters of white flowers that appear throughout the year.